Your nieces birthday is a wonderful occasion. The daughter of your sister may not seem like the closest family members but the bond that often develops between a niece and aunt or uncle can be one of the deepest and strongest. So when it’s your nieces birthday you will want to celebrate and enjoy the day with her. Maybe give her a lovely gift and card? But what you’re going to write in that card isn’t always easy. You will want to express exactly how you feel and make her know what she means to you. But if words don’t come easily to you or you need a little help then we’re here. 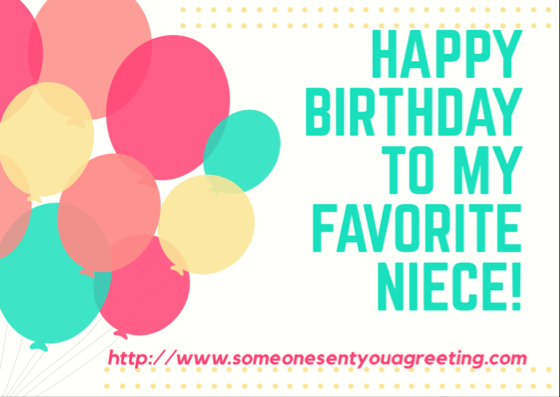 Follow this guide or use our examples to get the perfect birthday wishes for your niece. Begin your message with a simple greeting such as “Dear ____”, including your nieces name. If you want you can go a bit further and include some personal anecdotes or explain just how much she means to you. Depending on your relationship you might also want to make your message funny or have a religious tone. Finish your message with a warm closing, maybe wishing your niece lots of love. If you’d prefer not to write your own though then try one of the many prewritten wishes, messages and poems below. 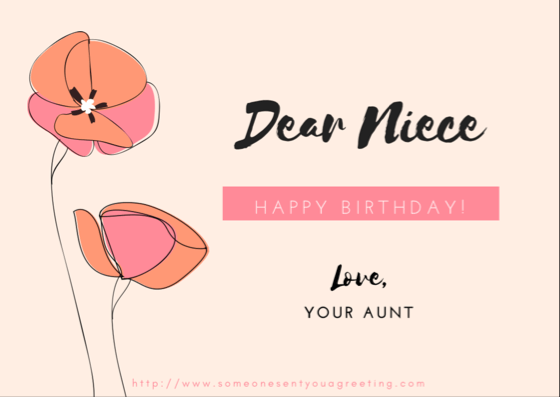 These happy birthday wishes and messages for your niece are quite general and can be used in most cards. Happy Birthday to my perfect niece! Every year you make me even more proud. Happy Birthday to my precious niece. You are the pulse of our family and the breath of each family gathering. Happy birthday to my favorite girl! You are funnier than any comedy and smarter than any book. Have an amazing birthday! You are one in a million and I couldn’t ask for a better niece! Happy birthday! Happy birthday, my sweet niece. The only advice I can give you on your birthday is to enjoy the present moment, value little things and never think about the past. The day you were born, you made me happy, but the day you hugged me with your little hands, made my heart melt. I am the happiest uncle on Earth because you are my niece. Happy birthday! Happy Birthday to my sweetest niece! Wishing you a great year! When your mom placed you in my arms after your birth, little did I know that she was placing you directly in my heart. Happy birthday, dear niece. I’m sending you birthday wishes and kisses! You are one incredible, beautiful girl! You are fabulous—it takes one to know one, right?! I wish the Happiest of Happy Birthdays to someone fantastic and practically perfect in every way! You are one-in-a-million! I am here in your life for a purpose – to spoil you, pamper you, indulge you, fuss over you, and allow you to do all those things that you parents don’t. 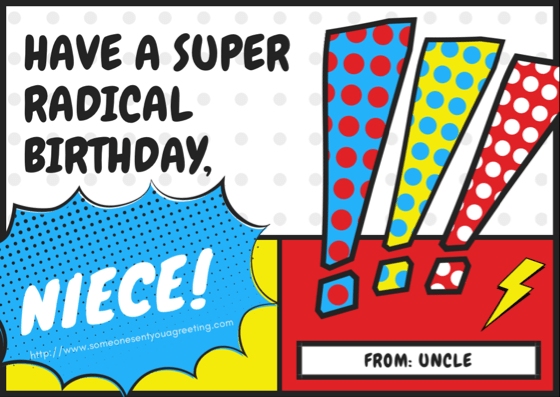 Happy birthday from your uncle. Happy Birthday to my beautiful niece! You have and continue to make me one very proud aunt! May all your wishes and dreams come true this year! I think instead of calling me ‘Uncle’ you should call me ‘Funcle’… as in the ‘fun uncle’. What do ya say?! Happy Birthday! Love from Funcle! I might be your Aunt but I would also like to think of myself as your friend. Best wishes to you on your special day. You are the most wonderful niece and I am so grateful to be able to watch you grow up into such a beautiful, intelligent, talented young lady! Happy Birthday! A good way to make your card stand out is to include something funny in it. Birthdays are joyous occasions so something humorous that makes the recipient laugh is always a good option. 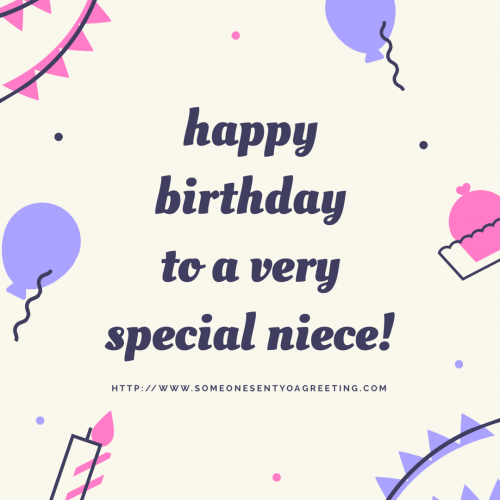 So use these happy birthday niece funny quotes and messages to put a smile on her face. Thanks to you, I’ve taken a trial run of fatherhood and I liked it a lot! Happy birthday to my favorite niece. Happy birthday, my favorite girl! I wish you to have fun at your birthday party. P.S. If your mom doesn’t allow you to organize a party tonight, call me and I’ll make a few arrangements. Is it your birthday again? Stop getting older because soon you’ll catch up to me! Happy birthday, beautiful! 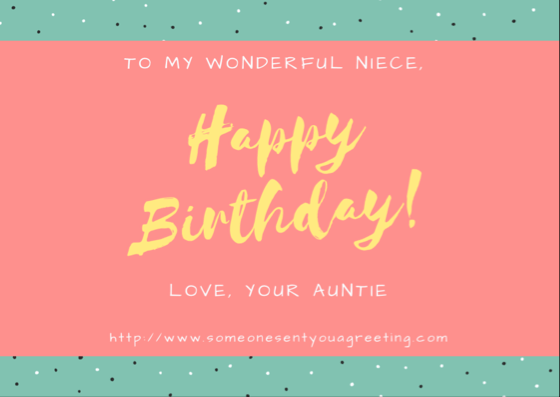 You are as beautiful, charming, intelligent, wise and cute as me – your favorite aunt! Happy birthday! On this birthday, we will do things your parents didn’t allow you to do. I will pamper my favorite niece. With love, your auntie. Statistics show that amazing nieces have amazing aunts. Happy birthday to my incredible niece. Happy birthday, my dear NIECE. You are N-nice, I – incredible, E – enigmatic, C – cute, E – energetic young woman. Enjoy every minute of your birthday because as you grow older, your birthday celebrations will also change. Look at me now. My idea of a birthday party is lots of cake and wine, and plenty of sleep afterwards! To my beautiful niece, have a wonderful birthday! If your mom says no to your party tonight, I want you to know that I have a party planner on speed dial. She can make it happen. Just say the word. Happy birthday! As your aunt / uncle, I have the official right to spoil you rotten and do the explaining to your parents. Your birthday is no different. Your wish is my command. Happy birthday, my niece! Happy Birthday, Niece! I was going to try and wrap up Ryan Gosling but he just wouldn’t stand still long enough to fit in the box! I hope your birthday is still a pretty incredible affair! If your niece is religious or has a strong faith then you might want to consider using a religious message. Below are bible verses and religious Wishes that are suitable for your nieces card. May God bless you and you’ll have wisdom, strength, and courage to meet all obstacles, overcome them and enjoy each happy moment in life. Happy Birthday! You have a special place in my heart and I can’t be grateful enough to God for having such a wonderful niece. Happy birthday! It’s your faith that will make you to stay strong but it’s your birthdays that make you old. So on this birthday of yours, I pray that your faith in God will grow even stronger, best birthday! A touching or sweet poem is a great way to show how much you care about your niece. It also works really well in a birthday card! So take a look at the poems for a niece below and see if any would work well for you. Or the fact that for you I have special emotions. Is that of each other we just can’t get enough. As time flies and years pass by their love tends to grow. An aunt and a niece’s bond is something that will always stay. 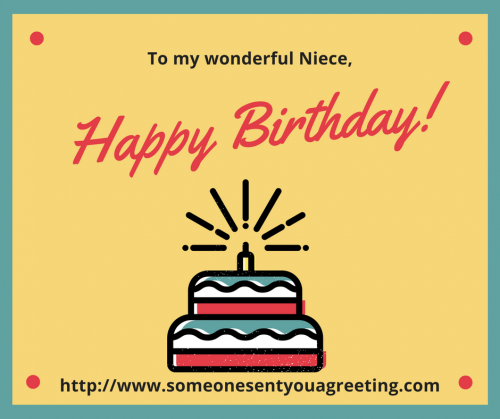 You can use these niece birthday images and pictures for free and in any way you like. They range from sweet through to funny. Post them on Facebook or Twitter, send them via Whatsapp or maybe even as an eCard. Whatever you choose we’re sure these images will be a great way to celebrate your nieces birthday.